The interior light can come on with the front doors open but not automatically. The people who get in the front can toggle the light switch on if they wish. People who open the rear doors or the boot wont be able to reach it so it makes sense from an economical point of view. Even if we assume that this car had front door sensors for the light (which it didn't) There is no way to know if the switch was toggled to "off" or "door mode" if it was on off then no lights are coming on regardless of what door you open. Further more you have the possibility of Avery reaching in to get the keys after he has pulled the battery. You also have to consider why Avery left this car there with his blood inside it. Yes we know he is a moron but also maybe the light was toggled to "off" in the first place and never saw what he left inside. So that is three possible senarios of whereby Avery has his hand near the ignigtion while in darkness. And we know this happened because he left his blood there. So you're trying to say that in the very area where a driver would need light, the designer decided not to provide it? I gave you a link to a forum where the issue of internal lighting was being discussed and it's clear the RAV4 did have this BASIC feature. It's easy to check out by asking Toyota. No that is not what I am saying. The light is there, but it must be toggled. But for argument sake even if the lights are all on everywhere it does not overcome the fact that the battery cable was pulled. Then nothing would work. Avery could then have removed the key after he done his. We know Avery's right finger came into contact with that area. Because the blood is there in the first place. Any alternative now rests on his recent recollection of wet blood being stolen from his sink. And as we already know from his girlfiend shooting his garage floor among other things he is not in the slightest a credible witness. And even if one is EXTREMELY generous enough to give him the benefit of the doubt over this stolen blood from the sink. From the moment he gets the blood in the sink, it leaves someone a 15 minute time frame to plant the blood in the car. And this was before the car was even found. The blood stolen from the sink according to Avery happened on the 3rd of November. The car is out of sight. Who is going to believe that? I sure dont. I don't believe his blood was stolen from the sink, but I also don't see how he would get one smear on the dashboard when removing the key and none on the key. It was a pretty big cut. We know from the blood in his Pontiac that this cut was not gushing blood. Also this cut goes right over a joint. The cut will alter depending on whether his finger is staight or bent. As for the key how do you know he didn’t notice blood on the key when he got in then washed it off? If you don’t believe the blood was stolen from the sink then what options are left other than he drove the car? His blood was on the gear stick and on the console beneath so it must have dripped. I don't know that he didn't wash the blood off the key but I doubt he would go to the trouble of washing the key but then keep it in his trailer. strong possibility that Avery is guilty, but don't think that Brendan is as involved as is implied. It could be that Avery and Bobby were involved - Avery could never admit that so all Bobby has to do is keep denying it. Bamber is another case. I am judging this case on its own merits. 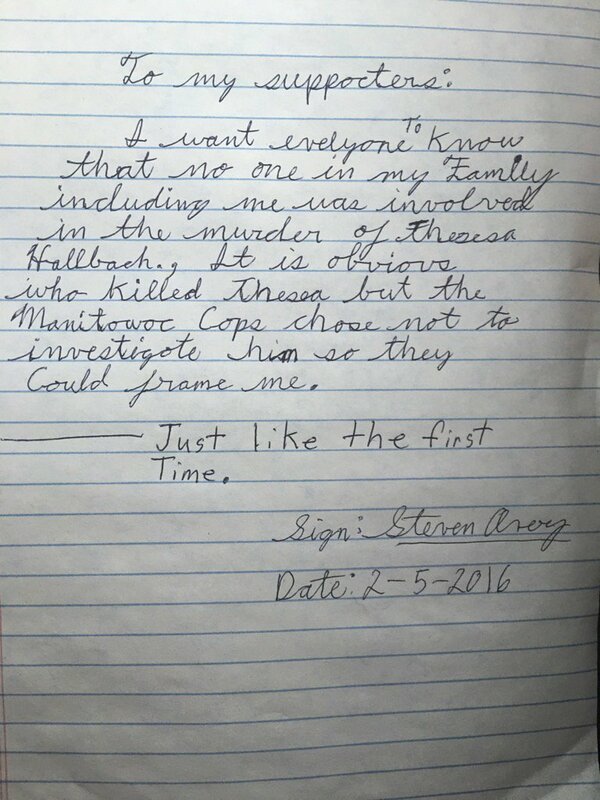 As for Bobby Dassey his testimony is corroborated by Tereas's last client before Avery. Its also supported by the timings of the phone calls between Avery and Teresa. Bobby also has two alibi witnesses Scott Tadych and more importantly Brendan Dassey who does not implicate him in the crime and also corroborates Tadych claim that Bobby Dassey went out hunting. It seems the TV show has distorted Bobby Dassey to make him look like "the real killer". The show also probably makes a big deal out of the photos of Teresa on Bobbys computer. However you can see these photos yourself in the case files. I have attached them. These photos are from online news articles when Teresa went missing. I bet the show was trying to insinuate that he was stalking her or something. Whether this is another case or not, fact remains that there is an issue of blood in the Bamber case too but it doesn't stop people thinking the silencer was a frame. Corroborated by the last client before Avery how? Supported by the timings of the phone calls how? Brendan isn't likely to point fingers at his own brother and police never suggested Bobby's involvement - had they done so, the suggestion would probably have been made. Tadych is also a suspicious character. No it the series didn't make much of Teresa's picture being on Bobby's computer - just the other perverted and sick images. Either he was planning to move the car again but couldn't because of the resulting missing persons investigation having all eyes on the junkyard and he had just enough braincells to realise he would be spotted driving her car and so was waiting for an opportunity. He is just a dumbass and put no thought into the implications of keeping the key. Given that it cops seven searches to find it, I doubt they found the key. Teresa Halback visited a client before Avery. He/She testified that Teresa Halbach would have arrived by their estimate at Averys around 3:00pm. (this client lived close to Avery). Bobby Dassey testified that he remembers her arriving around 2:45pm. Read through the telephone records between Avery, Teresa and her last client. Work it out for yourself. The real killer has cleared Bobby Dassey of any involvement anyway. So she was still taking photographs 45 minutes to an hour later? If BD was involved WITH Avery, he's hardly going to admit to it is he?